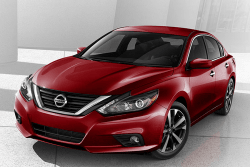 Nissan recently announced that it is recalling about 165,000 new vehicles because of the risk that they could shut off while the vehicles are in motion. The vehicles being recalled are 2017-18 Jukes, Frontiers, Sentras, Versas, Versa Notes, Micras, NVs, NV200s, and NV taxis. The recalls are being conducted in the U.S. and Canada. According to Nissan, the affected vehicles are equipped with a mechanical key. The key could be at risk of a defect that could cause it to move out of the ‘ON’ position while it’s in use. Nissan says the recall is voluntary and the National Highway Traffic Safety Administration has not issued a recall. Nissan is not aware of any incidents related to the recall, and says the recall is simply out of an “abundance of caution”. Canadian authorities have issued a recall on the vehicles and have told owners to remove everything from their key ring. Canadian authorities have also announced that if the affected vehicles were to crash, there would be an increased risk of air bags not deploying. Owners of any potentially affected vehicles are urged to use the NHTSA website to search their vehicle’s vehicle identification number to determine if their vehicle is subject to the recall. If you believe that your vehicle has been subject to a recall, it’s important to contact the vehicle’s manufacturer, as well as search the NHTSA website for your vehicle. If you have suffered injuries which you believe occurred as a result of a vehicle’s defect, call the Houston personal injury attorneys at Kennedy Hodges at 855-947-0707. We can help. Call us today to learn more or visit us on our YouTube channel.